Choosing the right day care center for your toddler is one of the toughest decisions you’ll ever make. You obviously want to know you’re leaving them in safe and capable hands, but how can you tell you’re making the right choice? It can be extremely nerve-wracking; particularly if you’re switching day care centers because of a bad experience. However, while it’s normal to be nervous, there are a few things you can look out for on your search, to ensure you end up choosing the very best for your little one. All day care centers need to be licensed. This ensures they are offering a healthy, nurturing and safe environment. The license requirements will vary depending upon each state, so it’s worth doing your research to discover the particular laws in the state you reside. Most respectable day care centers will have their license displayed on the premises. However, if you don’t see one don’t be afraid to ask. If they are unlicensed, you should absolutely walk away. Tip: If you really want to make sure the day care center is safe and trustworthy, you’ll want to look for ones that are accredited. By law, they don’t need to be accredited, but it is a higher authorization than a license. Therefore, if a day center is accredited you know it’s one of the best in the area. When you visit the day care, take a look around to see how many children there are. Obviously, you want to know there are other children who attend, but it’s important there aren’t too many children. This is because if there feels to be too many children and not enough staff, the center could be breaking legislation. You need to know when you drop your toddler off, they’re going to be well looked after. If there are too many kids and not enough adults, it’s impossible for them to keep a constant eye on your little one or give them the attention they need. Again, the legal requirements for how many children there should be per caregiver will vary between states. However, generally it’s between four to six children for each caregiver. Another thing to watch out for on your visit is how stimulating the environment is. Are the toys up-to-date or are they outdated? If it doesn’t come across as stimulating, it’s best to look for another center. The trouble is, if the day care isn’t stimulating, it’s going to have a negative effect on your toddler’s development. Ask staff about the activities they provide and see whether they are following any specific philosophies in terms of education. You can also look at the kids within the center to see whether they appear unhappy or bored. If they do, it’s a sure sign they are under-stimulated. This one’s a little harder to detect, but it’s definitely something you’ll want to look into. If the staff are continuously changing, it’s a good indicator that it isn’t a good place to work. Toddlers can grow attached to their caregivers, so if they are frequently having to get used to a new member of staff, only for them to keep leaving, it’s going to be a potentially traumatic experience. One way you can find out about staff turnover is by talking to other parents who use the center. They will be able to tell you how many employees have left since their child started. It seems absurd that a caregiver would choose to work in a day care center if they aren’t very loving or good with children. However, it sadly does happen. So, watch how the staff interact with the kids and see just how well they look after them. Do they leave toddlers to cry or brush them away when they want attention? If so, head to another day care center. One of the most important characteristics a caregiver needs is a loving, natural fondness of children. So, if they come across too harsh and unloving, it’s a red flag you won’t want to ignore. If you do sign your toddler up to a day care center, you need to know that you’ll be able to discuss any issues or concerns you have. That means, it’s important the management are able to schedule a meeting in a timely manner. If you struggle to get a meeting, it’s a sign they don’t see your concerns as important. So, only consider a day care that makes time for, and cares about your questions and concerns. These are just some of the red flags to watch out for. Obviously, you’ll also want to make sure the center is clean and safe. How hygienic does it appear to be and are there any obvious safety hazards you can spot? Overall, choosing the right day care center is essential if you want to give your little one the best start in life. It gives them an opportunity to socialize with others, they’ll learn to be away from you for short periods of time and it can really aid in their overall development. 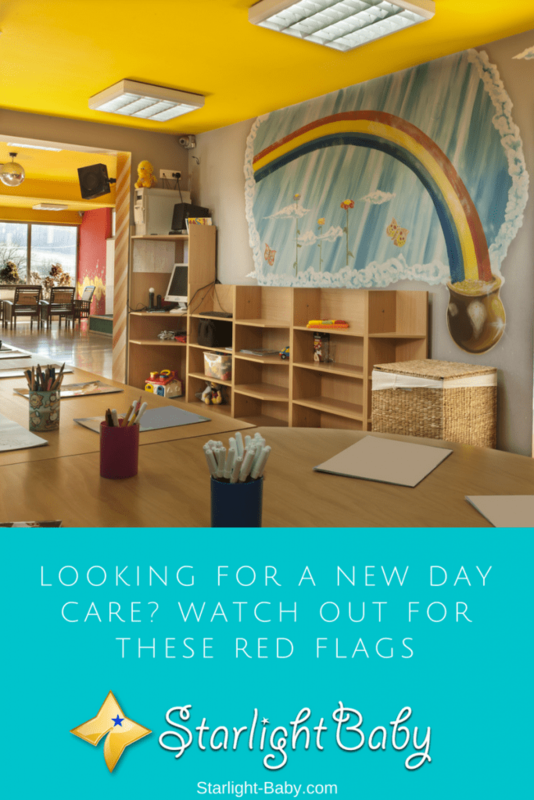 So, take your time to choose the best day care center and ensure you avoid the red flags above. Exactly, you are right on point. Finding a daycare is more than what many people think.It’s very wrong to just put your toddler in any daycare you see without first researching about it. When our dear son was still young and we are looking for a daycare for him.The first one we saw was overpopulated with many children. My question is why will a daycare have many children with a less staff to take care of them? Simply because they want to make more money! We left there immediately after the meeting regardless of their less fee. Researching a daycare before putting your toddler goes a long way and this one thing will save you serious problems that may arise in the nearest future. And the important thing is that you will come back each time to pick your toddler in sound health both physically&emotionally. This is indeed an educative post for many parents, thanks for creating awareness. You’re spot on there. Doing a research on a good, caring daycare is very important because it’s where you will leave your baby, so it’s important that it will be able to give the child the best care ever. Parents should never, ever entrust their child to any daycare without asking about its reputation. We’re talking about a child’s life here so no parent should be careless when deciding about a daycare,. I am a new parent, my baby is just 3 months old. My wife and I both work. However, when the delivery date came close, my wife took a long leave. She is still on her leave and spending her entire time to look after the baby. However, there will be a time when she will have to return to her work. Before she is ready to resume her work, we must look for a day care center for our baby. I found these tips very useful and informative. We have checked some day care centers, I did not know they were good or bad until I read this post. Now that I have read about the warning signs, I hope I will not take my baby to a place that is not good for him. This is legally right! Choosing the perfect Daycare for toddler is essential. Parents must checked the every details of the daycare’s documents and consider also the background of the school ,staff and the founder, like what we read in this warnings parents must aware about this said tips. It is true that any caring parent should be mindful of the daycare where they enrol their little kids to start school for that is the formative stage of their development apart from the teaching that they get at home. Looking around to make sure the environment is conducive for kids, watching around to count the number of kids already at the school can be easy. However, it is going to ake a sensitive parent time to find out if the school is licensed especially here in Africa with numerous back door events that always take place. This is one of the reasons many nursing mothers here are afraid to send their kids to school at an early stage. Thanks so much for these tips on the red flag to observe when looking to enroll your kid in a daycare, it’s definitely going to come in handy as my kid sister would put to bed soon and hopefully the child would have to be taken to a daycare centre at the right time. I definitely believe that licensing is the major thing to look out for when deciding on putting your child in a daycare, as this would guarantee his or her safety. And also looking out for center where there are lots of kids means that they are good at their job. So therefore they are worth getting ones child enrolled.